My name is Porshai, and for the past two years I have been a teen intern at the New England Aquarium. After starting the summer of my freshman year, I worked in Visitor Education and swiftly switched departments to work in the West Wing where I take care of many marine animals on exhibit at the Aquarium. Sea TURTLES Porshai, Dina and Josh at the MIT pool. Diving has come to consume my every thought and action even when I am attempting not to think about it. Saturday finally arrived, and I couldn’t help but feeling overwhelmed with excitement. 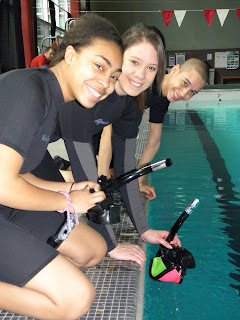 One of the skills we have been learning is how to assemble our gear, beginning with the "octopus." Unlike Athena, the aquarium's giant Pacific octopus, this one only has four arms. But they connect our regulator to the air tank and allow us to breathe underwater! As we pulled up to MIT, we quickly rushed to the rest room to change into our wet suits. After helping one another zip up, we took a giant stride into the pool and began the second pool session. Sarah taught us skills like the removal and replacing of our mask, breathing without a mask and controlling our buoyancy. Even though it was my second time entering the pool, thoughts of fear entered my head. Sometimes I repeatedly told myself “you can do this, you can do this” until I completed a task. 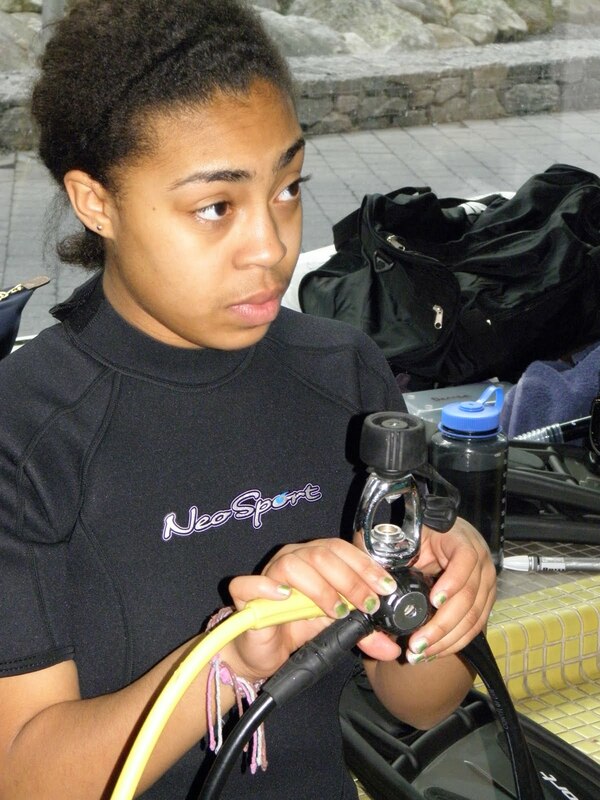 Sea TURTLE expedition leader and Senior Aquarist, Sarah Taylor, reviewing SCUBA skills with the team. As the day progressed, it didn’t take long to feel comfortable in the pool. The encouragement of my teammates and the extra help from Sarah and the other instructors left me secure and ready to take on the open ocean. We are trying to read your new blog entries, but we can't find them. Let us know if we are doing something wrong. Porshai has written two full posts and was quoted in a third. This link will take you to all of them. Thanks for following along!